To my dismay, he said nothing sweet! I had already made out a list of ideas and over half were sweet! Oh well, back to the drawing board, I thought. Then I had a few great ideas, none of which could be completed within 20 minutes. Ugh. I was 0-2 (a little sports humor for ya there!). Then, as I was researching some food for another project, it hit me! I love it when inspiration comes from somewhere totally unexpected. I think it helps to take a break from what’s stumping you, then when your mind is more relaxed, it will give you a little nudge. My Brain Nudge is bringing you Vegan Buffalo Bean Dip and Celery-Ranch this week! You're welcome... I’m welcome, my husband is super welcome and lucky. I guess my brain is giving me a confidence boost as well, haha. 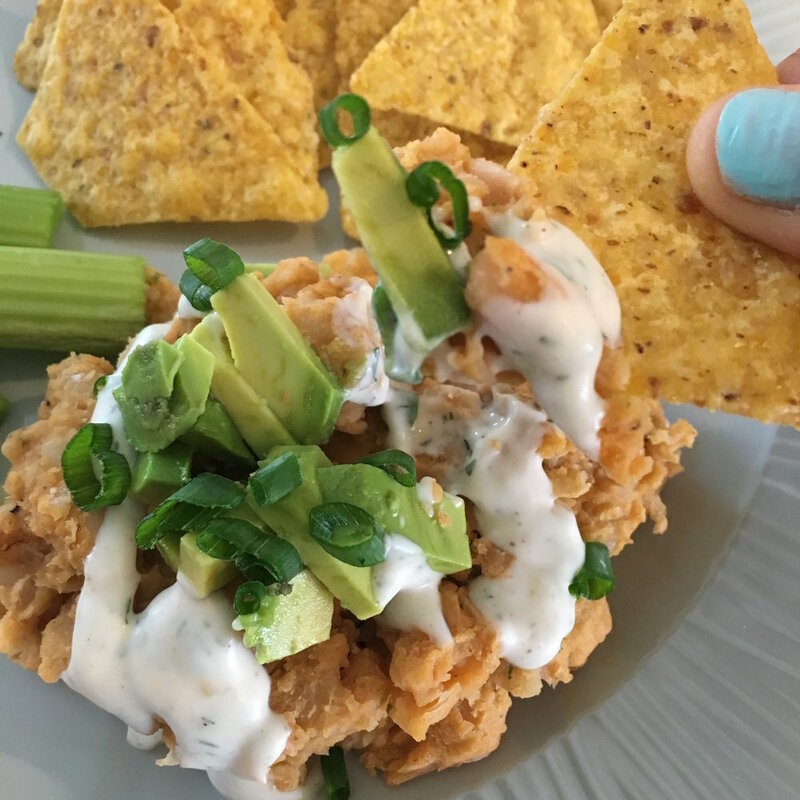 This party food has great protein, a little spicy kick, and I’ll be topping it with creamy-good-for-you-fat avocado and ranch. All fit for the “Sauce King.” Many of you may remember from the Vegan Avocado Mac + Cheese post that my husband loves to accompany his food with sauces, by the gallon. It’s a problem y’all. 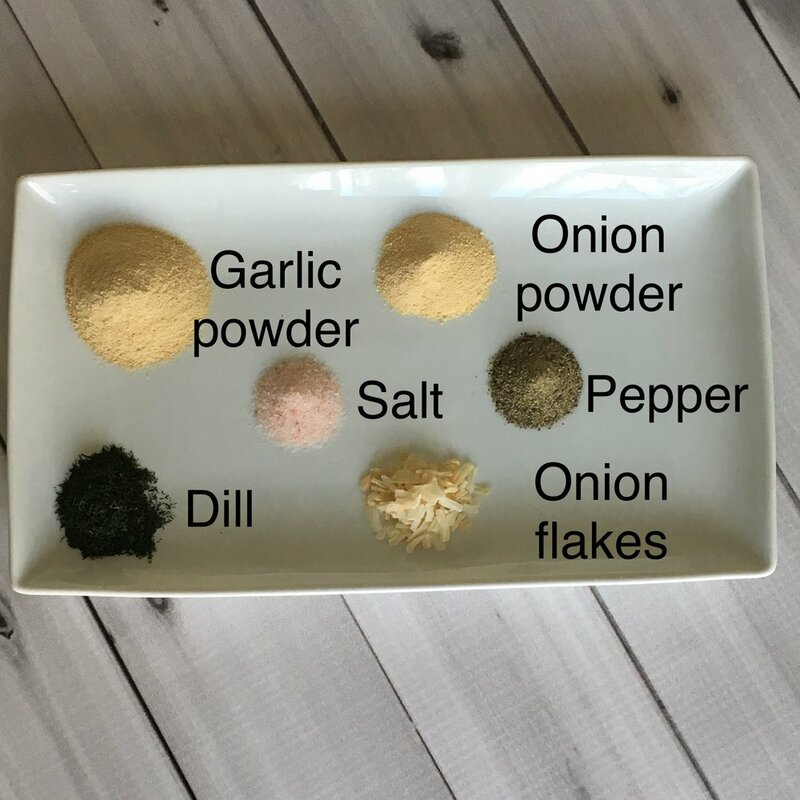 And if you're super short on time, just opt to buy one of these store-bought dressings from daiya to go with your bean dip (instead of making the Celery-Ranch)! I am not a huge basketball fan, but I love a good party and good food. Any excuse to have food and fun with friends and family is a recipe for #winning in my book! Hope you all have a great time watching, cheering, and most of all, eating! 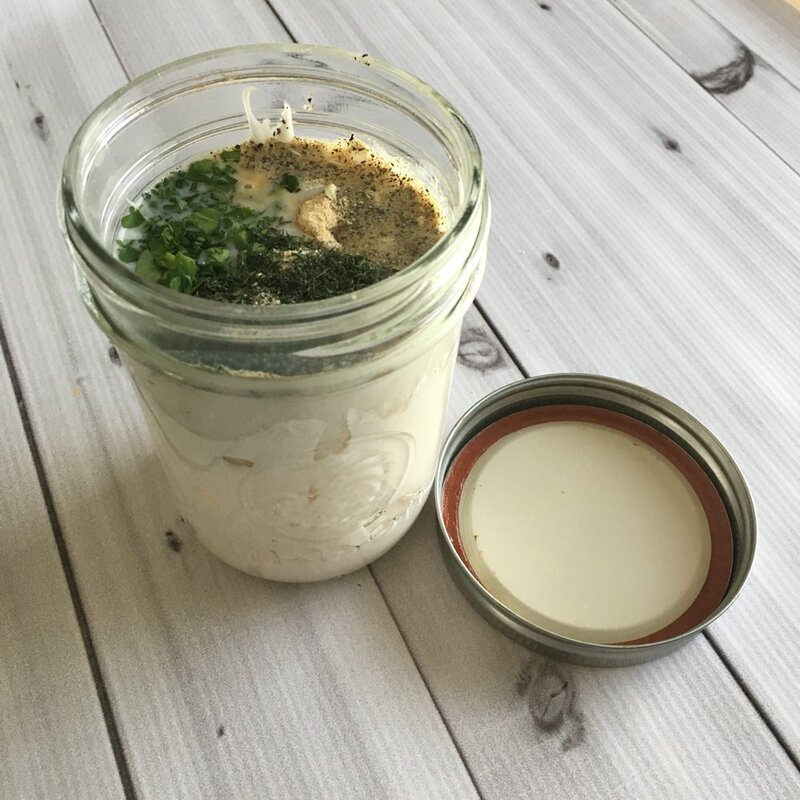 In a medium bowl or a 16-ounce jar with a lid that seals, add the mayo, milk, parsley, garlic powder, lemon juice, dill, onion powder, sea salt, and black pepper. Whisk the ingredients together in the bowl, or stir them slightly in the jar before putting the lid on the jar and shaking it well to combine. If the mixture is too thick, add more milk or water to thin it. Adjust seasonings if necessary, then refrigerate or set aside while you make the bean dip. Heat the vegan butter in a large cast iron skillet or sauté pan over medium heat. Add the garlic and sauté until fragrant—about 1 minute. Add the beans, hot sauce, parsley, salt, pepper, paprika and ¼ cup of water, then stir to combine. As the mixture heats through, begin mashing most of the beans with a potato masher or the back of a spoon (I made mine chunky, but didn’t leave any beans whole). Heat the bean mixture through for about 5 minutes. Once heated and mashed, it should be the consistency of refried beans. Taste and adjust seasonings if needed. If the mixture is too thick add up to another ¼ cup of water and warm through before removing from the heat. To serve, add to a bowl and drizzle with the Celery-Ranch, adding toppings of your choice. Or serve the Celery-Ranch and Bean Dip separately. Both of these dips can be made ahead. The longer the ranch has to marinate, the better it will taste. The bean dip can be rewarmed with a little water or veggie broth added to keep from scorching. The ranch will keep in the refrigerator up to a week. The bean dip will keep in the refrigerator up to 4 days. Bonus Note! If you have too many dips, or need to make it more interesting…You can make the same recipe, only you can heat or not heat the beans, spread it on a store-bought, cooked pizza crust and garnish with avocado, green onion and drizzle with the ranch on top! Yum! Maybe you could make it into tacos or nachos! This recipe is the gift that keeps on giving!